There will soon be a bazillion (is that a real number?) cases for the iPad. Choosing the “best” one can become something of an exercise in futility as they all offer some feature twist the other ones don’t. The case, or cases, you ultimately select will be based on your own need, or how and where you intend to use your iPad. For example, I have a minimal case I use at home, but when I am out of the house, I use a binder type case. Sometimes I get very daring and use no case at all! Yes, short of running with scissors, I can live dangerously. Today we are looking at the Marware SportShell Convertible. The SportShell Convertible attempts to maximize several features from other cases by offering this “4 cases in 1” design with interchangeable parts. It is a hard shell case, a photo frame, a stand, and finally, a stand case. Let’s look at each of these options. 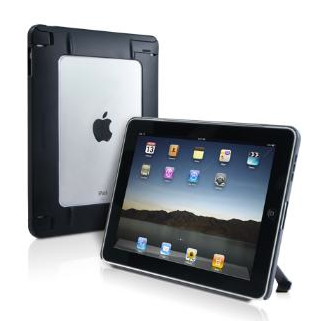 The case is made of smooth plastic that covers the edge and a portion of the back of your iPad. I’m not sure I’d call this a “case” in the normal sense. It is more like a guard that covers the edges of the iPad. The back of the “case” has a rectangular 5×7 opening where you can insert a picture and then snap a clear cover over it. This is the Photo Frame option. Suppose you don’t want to put a picture or other artwork in this slot? 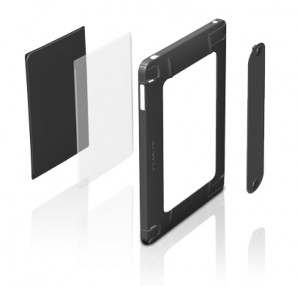 Marware has your back as they supply a black cover that snaps into place instead of the clear cover. These are interchangeable and can be popped in and out on demand. Frankly, I find this feature of dubious value. If I had a picture or artwork I wanted to show off, why wouldn’t I just have it on my iPad? Still, you may like this feature. 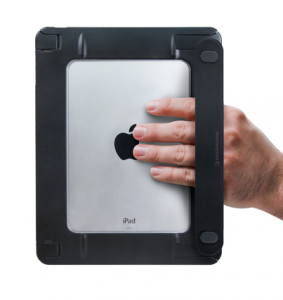 The case has four hinged fold out “feet” that you can deploy to have your iPad stand in either landscape or portrait mode. On the back of the unit there is a hand strap (I am still trying to figure out why case manufacturers think we need these?) that attaches to a slot underneath the hinged fold out feet. If you leave the strap in place, it becomes a bit of a problem to close the hinged fold out feet because the edge of the strap gets caught when you try to snap the feet closed. However, the strap is easily removed. This strap can be used horizontally or vertically. In portrait mode the feet hold your iPad at a photo frame angle. The viewing is fine at this angle, but when I went to launch an app and pressed an icon that was high up on the screen, it felt like my iPad wanted to topple over. Starting an app that was positioned from the middle, downward, seemed to be okay. Assuming that all you’d want to do is leave your iPad in photo frame mode, and just look at the pictures, the feet seem fine. Otherwise taping on the screen gave me a constant fear of the iPad tipping over, or worse, sliding across the table. In landscape (easel) mode the case was much more stable and the viewing angle was very good for a movie. While watching a movie, there really aren’t many buttons you might push, so the sliding issue was much less pronounced. 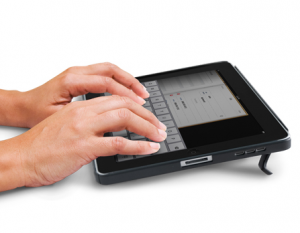 When used as a typing stand, the Sportshell Convertible is at a good angle, and there wasn’t any sliding to speak of. When the case is on your iPad, you have access to all of the ports and buttons. However, you won’t be able to use the Apple Docking Stand. Installing your iPad into the case requires you to snap the case around your iPad. This can be a bit challenging as you squeeze your iPad into the case, pushing and snapping. Marware also provided a clear film for the iPad screen, but there is nothing in any of the literature showing that a film is included. The Marware SportShell Convertible case for iPad offers a minimalist approach to iPad cases. 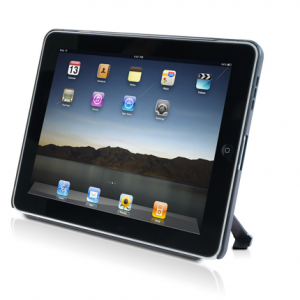 It offers decent protection for the edges of your iPad while allowing options that only a dedicated stand could give you. 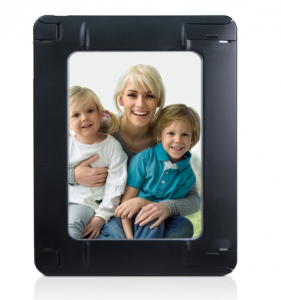 You may like the photo frame back and use the portrait stand for showing your iPhoto library.